"Hanging Captain Gordon is a much-needed work. Thank you for writing it." "fast paced [and] Informative, but never dull or pedantic, this book hums along quickly... Soodalter's vivid depictions of slaving voyages present the squalid conditions aboard slaving ships... his survey of slaving vis-à-vis the Gordon case will appeal to casual and serious readers of history." "Soodalter's fascinating and disturbing account of this obscure episode in our history is a story replete with political intrigue, cynical opportunism, and, of course, immense tragedy... This outstanding work will interest both specialists and general readers." "Soodalter does a fine job explaining just how unusual Gordon's prosecution was.... [He] marshals court documents, newspaper accounts, and private letters to skillfully re-create the courtroom drama.... The Gordon case is an excellent lens for examining the antebellum slave trade....[W]hat is most regrettable is that, until now, so much of this sordid story has remained untold." "A fast-paced, almost juicy narrative.... Soodalter has uncovered this largely forgotten chapter of history and spun it into a sweeping drama, performing the neat trick of packing rich veins of historical information and horrific subject matter into a style both engaging and entertaining.... [He] brings a rare novelist's flair to the subject." "It opened up a side of slavery that we normally don't talk about in class.... Overall, this turned out to be one of the better books I've assigned in recent years (and I change books ALL the time)." 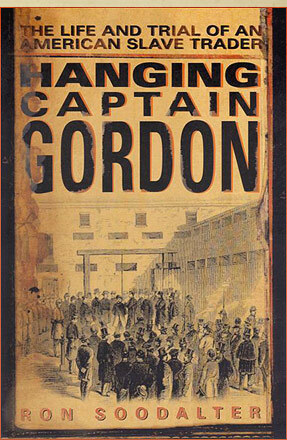 "Hanging Captain Gordon is recommended as a fascinating and compelling read." "The story of "Gordon the slaver" has lived on in the footnotes of national studies and in the dusty margins of local history…. Ron Soodalter changes this equation with Hanging Captain Gordon: The Life and Trial of An American Slave Trader. The author, for the first time, gives us a serious portrait of Gordon, his family and background. He then provides a riveting study of Gordon's slaving career and the trial that brought about his doom. To his additional credit, Soodalter provides a remarkably clear social, political and economic understanding of the times in which Gordon lived and functioned. We learn not only what happened and where but (through knowledge of complicated back stories) the why of it. Soodalter is a first-rate writer…." "This valuable book tells with satisfying thoroughness, clarity, and drama the half-forgotten story of the only slave trader executed under American law -- and uses that vivid episode to illuminate the terrible history of the slave trade and its echoes today. This book is a solid achievement." "This is informative history with important current human rights significance. Superbly researched, well written, sensitively treated. This book deserves a wide audience." "This is living history that reveals our world today, where governments support profit before principle, and the rights of investors over those enslaved around the world.... This wonderful book illuminates our country's love affair with the profits of slavery then and now." "Civil War buffs looking for a different take on the root cause of the war, and also fans of legal history, should relish this. This book makes the case that even the small events like Gordon's trial are part of history's epic sweep." "This is a landmark book. Recommended for all Civil War and African American collections at both public and academic libraries." "Mr. Soodalter has written an engaging book about a forgotten incident in American history." "On February 21, 1862, Gordon was duly hanged in New York, the only American ever executed as a slaver. Soodalter's fascinating study shows with admirable scholarship and verve why this was so.... In an epilogue, he summarized the disquieting evidence that slavery is with us once again, not least in these United States. All of this book is valuable, the epilogue most of all."